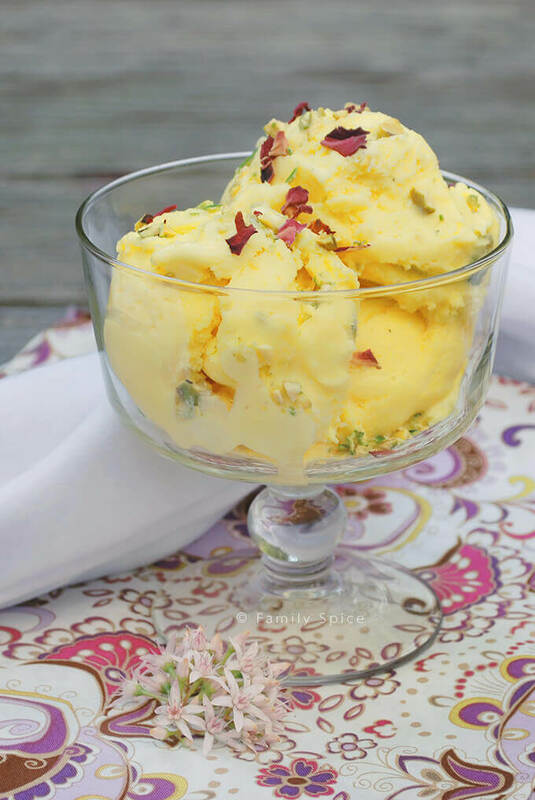 Try a bit of the exotic with this No Churn Persian Ice Cream with Saffron and Rose Water (bastani). It’s easy to make at home and WITHOUT an ice cream machine. Summer vacation in San Diego should run July through September; those are our hot months. It seems like the heat really kicks in when the kids return to school. Not that I’m whining or complaining. The ice cream maker is in full swing and the popsicles are in constant supply. For a taste of the exotic, the kids really love this Persian Ice Cream with Saffron and Rose Water (bastani). And it’s easy to make WITHOUT an ice cream machine. 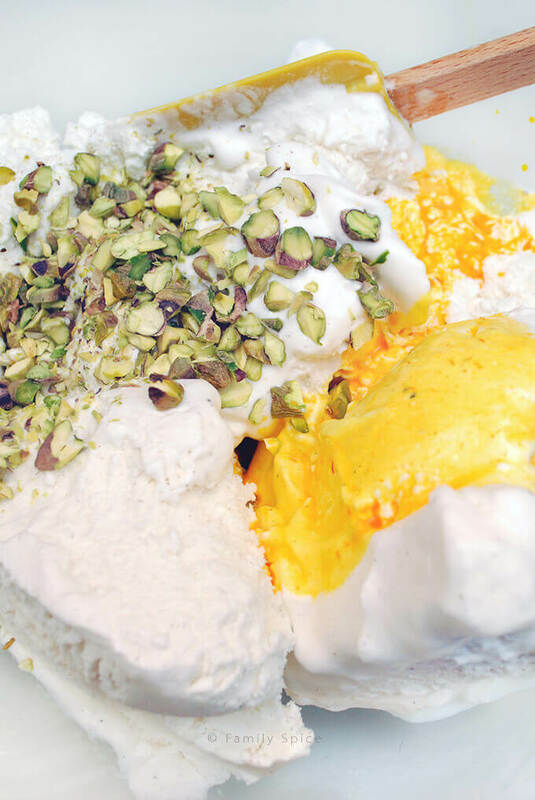 Bastani is traditionally a custard like ice cream, rich in flavor mixed with saffron, rose water and pistachios. It is quite recognizable with it’s glorious golden yellow color and aromatic from both the saffron and rose water. Although you can make it completely from scratch, with heavy cream, sugar and eggs, we’ve come up with a short cut versions, starting with ready made vanilla ice cream. You see, we are rather impatient and honestly it tastes almost like the real thing. The key to this short cut version is to start with high quality vanilla ice cream and let it soften a bit. This should take about 30 minutes sitting on the counter. Transfer the softened ice cream to a large bowl. The other key ingredient is saffron. You want a high quality saffron, which gives your bastani its golden color and intoxicating aroma. 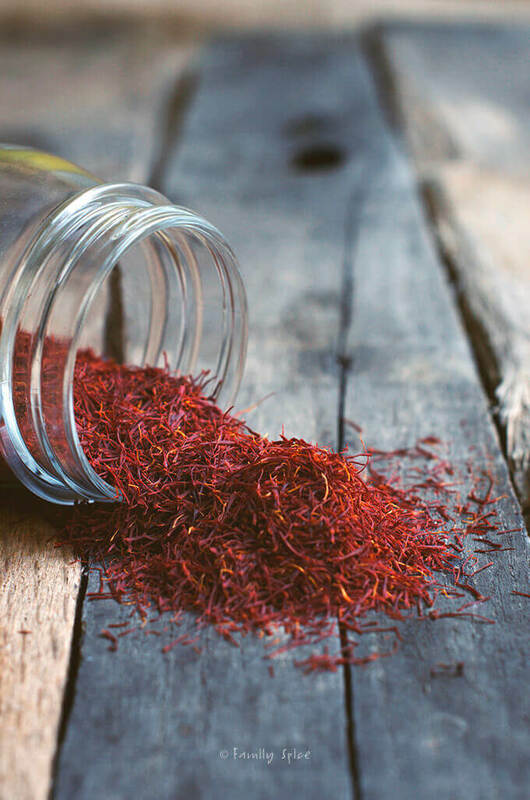 Crush your saffron using a mortar and pestle and dissolve in a bit of warm water. This should steep for about 30 minutes, so do this while your ice cream is softening. 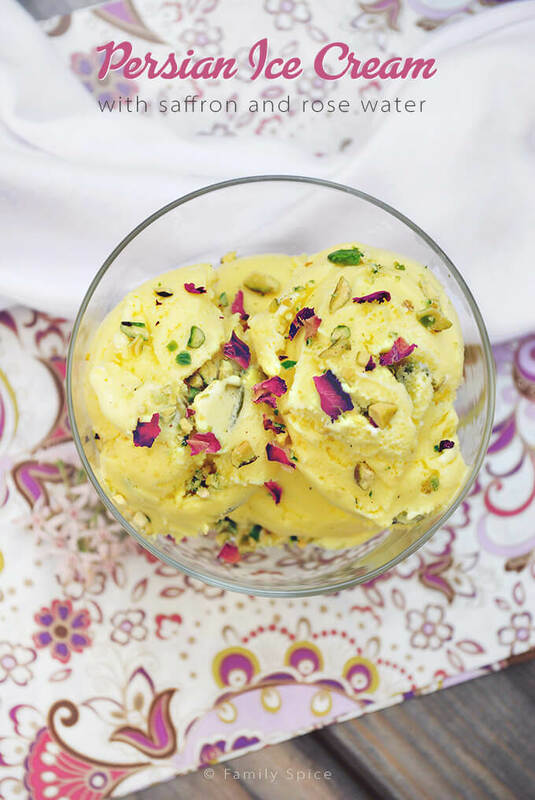 Once your saffron water is redish orange, add it to your softened ice cream with the rose water and pistachio bits. 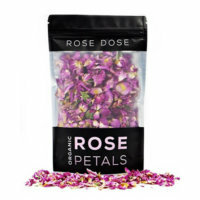 You can also add a teaspoon or two of crushed dried rose petals. It adds a bit of color as well as fragrance. Transfer your soft ice cream into a freezer safe container, and place it back in the freezer to let it harden. This usually takes about 6 hours. I know it is impossible to be patient, but do your best. As I’ve mentioned in previous posts, the amount of saffron you use is dependent on the quality of the saffron used. This affects the final color of your ice cream as well as the fragrance and flavor. I always recommend to my readers and friends to buy saffron threads and not powder. High grade saffron threads are dark red, not orange and no trace of yellow. When you open your container of saffron you should be able to recognize it’s beautiful scent. 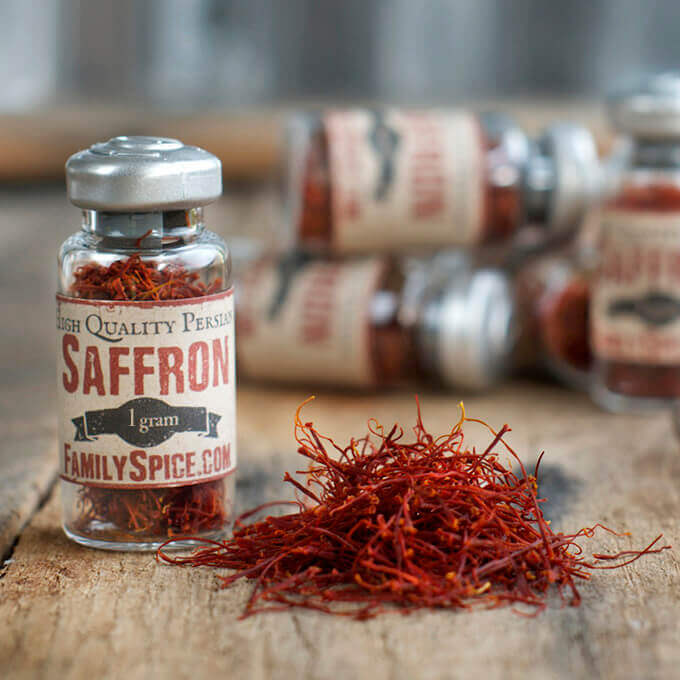 Yes, saffron can be expensive, but don’t be duped and purchase cheap saffron. The color and aroma produced will not be the same. I actually sell saffron here on my blog. It is of high quality and from Iran. 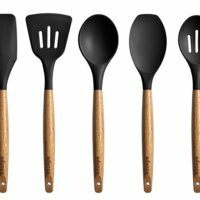 I’ve priced it so that you don’t have to break the bank just to use it in a recipe. And although some people think that turmeric is a fine substitute for saffron, IT IS NOT. Definitely do NOT use turmeric in ice cream because you will end up producing something gross. If you cannot find rose water in your specialty markets, you can find it online here on Amazon. Neither the saffron or rose water can be substituted with any other ingredients. It just wouldn’t be the same ice cream we Persians love so much. And if you are ever in Los Angeles, you must visit Mashti Malone’s. It’s an iconic ice cream parlor that makes the best Persian ice cream with saffron (bastani). It is typically served as an ice cream sandwich, pressed against two wafers, and it is positively incredible. Until then, you’ll just have made do with my very tasty (and easy) no churn recipe. 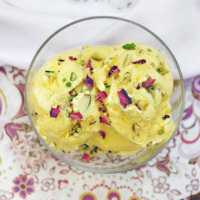 Try a bit of the exotic with this No-Churn Persian Ice Cream with Saffron (bastani) and Rose Water. It’s easy to make at home and WITHOUT an ice cream machine. Allow ice cream soften at room temperature for 10 minutes. In the meantime, combine saffron and hot water in a small bowl. 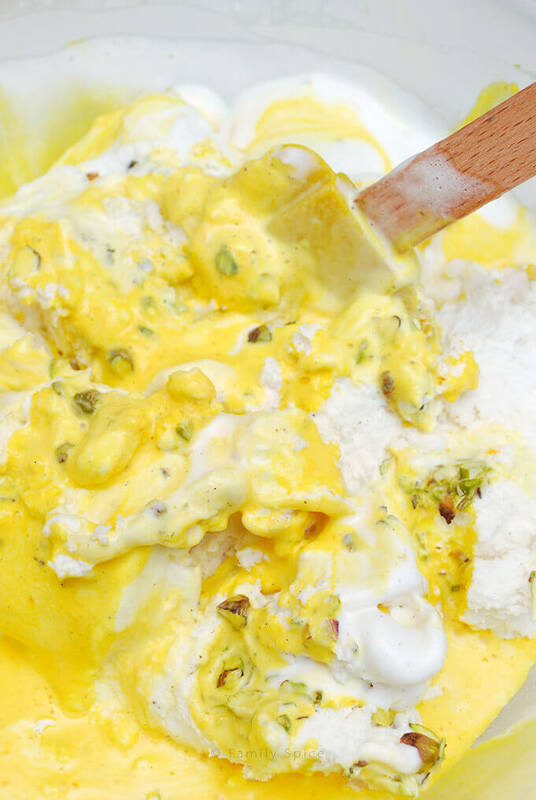 When ice cream has softened, place in a large bowl and mix in saffron mixture, rose water and pistachios until thoroughly combined. Scrape ice cream back into it's original container and freeze until hardened, at least 6 hours. This looks fantastic! If you were making ice cream from scratch I would assume that you’d put the saffron and rose water in the mixture before freezing? Yes, you would make the ice cream first in the machine, then stir in the rest of the ingredients prior to freezing in the freezer. That’s a nifty short cut! Very good idea. I don’t use saffron much, in part because it’s expensive, but more so because I’ve really never learned to use it well (which is because I don’t use it!). I need to buy a bunch someday and just play with it. An expensive education, but a tasty one. Anyway, thanks for an interesting post. What a pretty ice cream, I love the saffron here! This is beautiful! 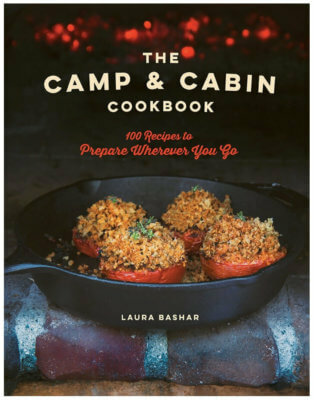 I can’t wait to try your recipe – simple but elegant. Love this short cut method ! I like easy cooking 😉 This is delish ! Will be making it. Pinning it for the future 🙂 Thanks for sharing ! I love stirring anything into ice cream. It’s such a beautiful sight and this looks quite exotic. OK – Sold! Now I know how I’m going to use my saffron! Looks amazing! We just bought a new jar of saffron. 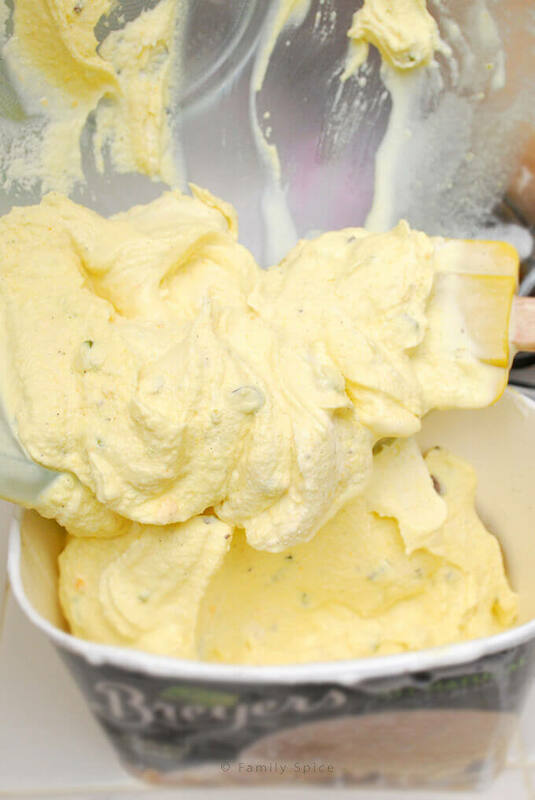 I need to make this – I’ve been trying to do it ever since I learned aobut saffron ice cream!! And the rosewater! Oh, this is just gorgeous. I will try it with the coconut (vanilla) ice cream and see how it goes! Thanks for the saffron tips too! We have a Persian restaurant that we love to eat at and they serve the best Persian Ice Cream. It’s expensive to eat there so this will be a nice treat. Make your own Persian food at home! I hope you enjoy the ice cream. It’s cheating by using pre-made vanilla ice cream, but that’s what make this such an easy recipe!